Right up to the present day, there is a widespread belief that the recourse to Marx - and in particular Marx's critique of political economy - in Adorno's work represents a relic from stages in his theoretical development which were quickly overcome. 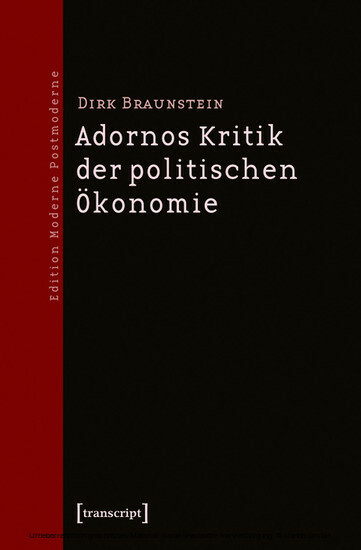 By way of relevant, to date largely unpublished texts and documents, the author refutes this thesis, and shows that at the center of Adorno's critical theory of society stands a critique not just of political economy, but one of economy as such. Dirk Braunstein (Dr. phil.) studierte in Bochum, Köln, Frankfurt am Main. und Berlin und gibt die Vorlesung »Philosophie und Soziologie« aus dem Nachlass Adornos heraus. Er arbeitet in mehreren Projekten zur Kritischen Theorie Theodor W. Adornos. Wie kommt das Heil in die Geschichte?